Paris isn't the first place that springs to mind when you think of cheap travel, but there is a surprising amount to do and see, even on the smallest budget. So much of the city can be viewed from the streets, but food and drink also needn't cost you the earth if you're staying in the French capital for a few days. I recently spent 4 days in the city with my sisters to celebrate a birthday and realised that a visit to Paris needn't break the bank. 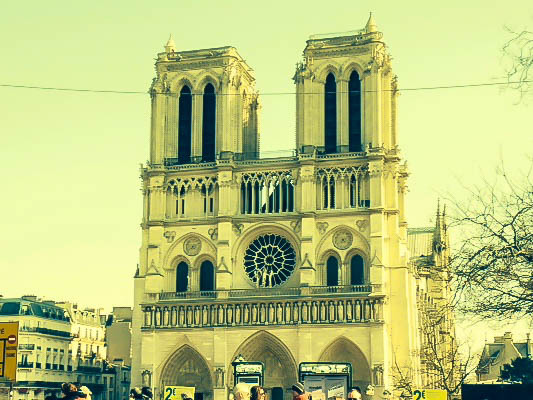 The world famous Cathedral is free to enter and is one of Paris' most spectacular sights. Notre Dame is located on a small island, the Ile de la Cite, which lies in the middle of the Seine, close to the Latin Quarter and Saint Michel. Notre Dame has no admission fee and there's no onus on you to pray while you're there. The bridge is a tourist attraction in its own right; billing itself as the oldest bridge in the city. This confuses me, somewhat, what with it being called 'nine' and all. That generally makes me suspect there are eight older bridges, but what do I know about French counting? The bridge also has the added bonus of having a million (i'm obvs guessing) love padlocks attached to the railings at the sides. Sounds mushy; is mushy, but also good fun reading all the inscriptions and being desperate to find a Scottish couple called Tam and Senga. On this occasion, it was not to be. Maybe next time. As with ND, this fabulously whitewashed chapel is free to enter and is well worth the walk up the steps to enter. The views are truly spectacular, and it's a beautiful spot to sit and relax, looking out across the city. Also, on the way to Sacre Coeur, you can get your photo taken at the Moulin Rouge, as both are located in the Montmartre area. You can even try out some can-can for free on the streets..you know, if that's your kind of thing. A short metro ride away from the middle of the city, Pere Lachaise is a beautiful graveyard (yes, I actually mean that), houses many famous occupants. The cemetery is the final resting place of Doors frontman, Jim Morrison; Irish author, Oscar Wilde; French Opera legend, Maria Callas; and La Vie en Rose chanteuse, Edith Piaf. You can pick up a free map outside the gates and immerse yourself in the peaceful beauty of the masoleums and stones on show. Apart from Jim Morrison's grave, which was covered with joints and flowers and guarded by two scary blokes with guns. Totally made his grave easy to spot from a distance, though. Maria Callas wasn't much of a troublemaker, I believe. At Pont D'Alma sits a life sized replica of the flame that was gifted from France to America, to sit in the hand of the Statue of Liberty. The flame glows in the sunshine on the banks of The Seine and also serves as a memorial. Incidentally, it is also above the Pont D'Alma underground bridge, which was the location of the fatal crash involving Diana, Princess of Wales and Dodi Al Fayed. Diana's photograph is a permanent fixture on the flame memorial statue and makes an already sobering memorial all the more sad. Yeah, OK, so I like graveyards; don't judge me. Montparnasse is the eternal resting place of many a famous French person, including author, Jean Paul Satre and his partner, Simone de Beauvoir. It's a lovely place for a wander, if you like walking amongst the dead and it's a surprisingly beautiful area. No, seriously. Don't stand in the middle of the street to get a photo, unless you no longer want to live. 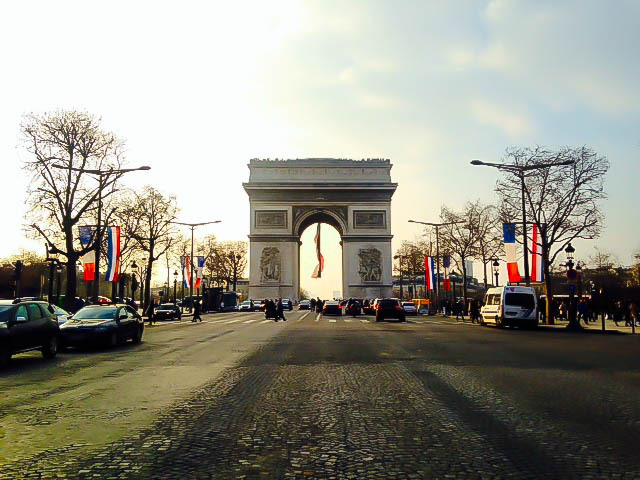 In the middle of Paris, if you can avoid the crazy lines of cars whizzing back and forth, you can check out the beautiful main boulevard, as well as the Arc that serves as a symbol of those who died fighting in the French Revolution and Napoleonic wars. The Champs Elysees is beautiful by day, but even more special to view when lit up at night. The main shopping street is a mix of upmarket stores in classic buildings, to the slightly odd and very modern designs, such as the Peugeot shop. The Arc sits at the top of the avenue and, although a fee is charged to enter, you can't be charged for taking photos and wandering around the impressive exterior. Paris can be extremely expensive to eat out in but it needn't be for your entire trip. If you like street food, such as crepes, pizza and baguettes, you can actually eat on the go for a reasonable price. There are tons of tiny places up and down side streets that will cater for all your Nutella cravings for a small fee. Staying in Saint Michel on this particular trip, we had a range of options, including the expensive riverside Cafes and cheap, off the main street, pizza carts. You are never far away from choice in Paris, so don't stop at the first thing you see. You'll always find something in your price range just a hop away. Can't start my day without one. 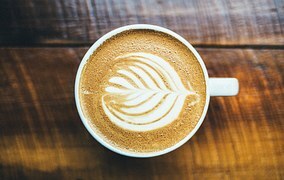 I like my coffee, as do my sisters, so we all agreed that the first activity each morning was to knock back a cafe au lait or two. I'm not an instant coffee lover, as my Nespresso machine has forever ruined that for me, but I'm also not a complete coffee snob. In the city, you're never too far away from a McDonald's and, although I don't personally touch the food, the coffee is really excellent. It might not conjure up the same romantic image of sitting in a pavement cafe by the River Seine, but it's cheap and it's good. Besides, you can grab a cup from McD's and wander off to the nearest bridge or fountain and pop yourself down for a few minutes. It's the same view for a fraction of the price. For drinks, it can be a little pricey for wine and beer, but so many bars have a cheap happy hour menu where you can indulge in some excellent Gin Fizz or a very tart Margarita for around 4€80 - €6. 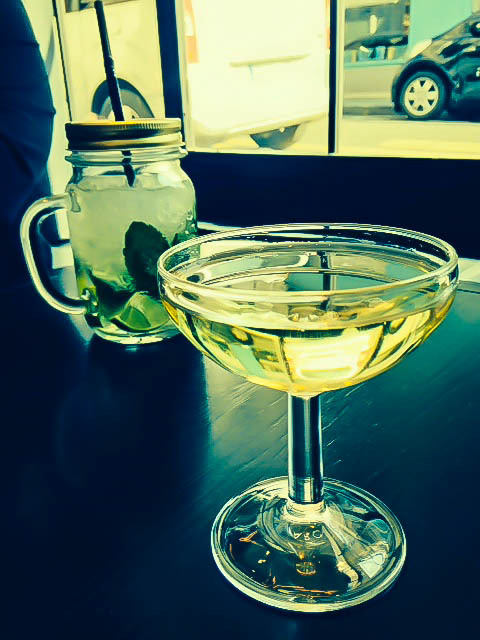 If you're a fan of Champagne, expect to be set back around €13 for a semi decent glass. 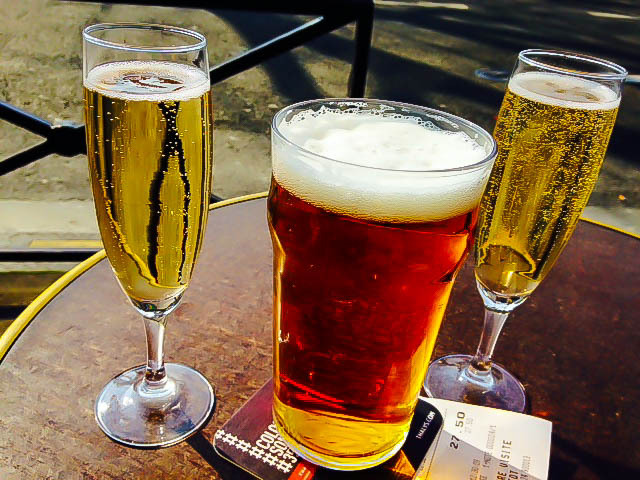 I paid around €10 for beer and lager, and small glass of red or white wine was similarly priced. If, like us, you stay in a hotel or hostel and can take bottles to your room, grab some beer or wine at your local store for a percentage of the price you'd pay in a bar, and have a glass (or keep it classy with a plastic cup) before you hit the streets in the evening. There's no shortage of hotel accommodation in Paris and, obviously, it can be pricey place to bed down for the night. There's also a huge range of hotel rooms that won't cost the earth and are clean, tidy and the perfect place to lay your weary bones after a day of pounding the city's cobbled streets. Hotel Eugenie in Saint Michel will set you back around £40 a night and is a short walk from Notre Dame on the Left Bank. In terms of location, it's practically perfect. Hotel de L'Europe is also a cheap stay at around £100 for 3 nights for a single person. 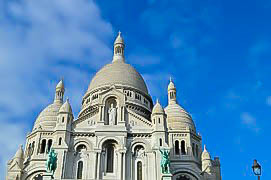 The hotel is located in the 11th arrondissement and close to the metro station at Belleville. Ibis Budget Paris Porte de Monmatre comes in at around the same price and is in the 18th arrondissement, but is a little further away from the main city centre attractions. Regardless of where you stay, time of year will always dictate pricing to a certain extent, so expect to pay more during the main tourist season and get more of a bargain over the shoulder months. As with every other major city on watch, Paris is also home to some super hostels. You can pick up a decent multi-room, or pay for a private one for a little more. I'm not a fan of hostels, so I'm far happier paying £40 a night for peace, quiet and the knowledge that I might wake up in one piece. I'm kidding - I know hostels are mostly safe but, in the middle of the night, in my head, they're anything but. 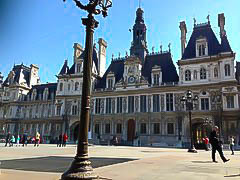 You don't have to stay at the Hotel de Ville to have a good time. Paris has a widely efficient RER (overground train) and Metro (underground train) system, which are both accessible and reasonably priced. They can both be oversubscribed during rush hours, so just because a train is due, doesn't necessarily mean there will be space to get on it. You can hire a segway to get your round the city (and these often come with their own tour guides), if you don't fancy the Metro but also don't want to put one foot in front of the other. There are countless hop on, hop off tour buses around the city, where you can purchase daily tickets and then jump around your chosen sights without having to descend under the streets to the Metro. These are a bit more expensive, but you do get to see where you're going, and often from the lovely vantage point of the top deck. This is a particularly excellent way to travel on a lovely, sunny day. The benefits of seeing the city by foot. And by bar, obvs. Let's face it: all you need is some flat and comfy shoes (note to my sister who wore massive heels for two days before we forced her into a Sketchers store) and the world, or Paris, rather, is your oyster. 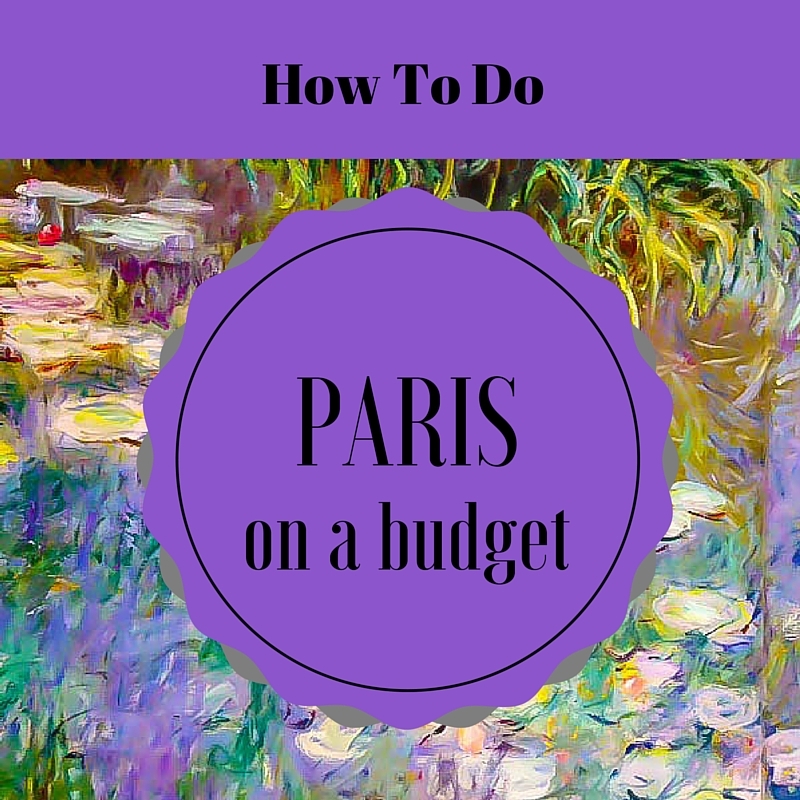 Do you have any tips for Paris on a budget?